Watch the Michael C Ross Interview from Royaltone Studios here! Dance pop song, a la Katy Perry meets Taylor Swift, looking for female singer with music video presence. Recording to take place at producer Michael C Ross' (Christina Aguilera, Vanessa Carlton, Lisa Loeb) studio in Burbank. Video shoot to take place in Los Angeles locations (tbd) following the recording. History: Ross is one of LA's most sought after engineers today having worked with an eclectic client list covering Rock, R&B, Pop, Jazz, Big band, Blues, Country, Gospel, Latin and Folk genres. Additionally, he has an impressive body of work in the Film/TV arena: "Moulin Rouge", "Drumline", "Big Momma's House", "Me Myself and Irene", "Titan AE", "There's Something About Mary", "The Siege", "Corina, Corina" and "Father Of The Bride." Partial list of Ross Artists include: Christina Aguilera, Vanessa Carlton, Lisa Loeb, Mya, Samantha Mumba, Counting Crows, Mick Jagger, Keith Richards, Lit, Smithereens, Ry Cooder, Taylor Dane, Barry White, Isley Brothers, Ojay's, Eric Clapton, Vonda Shepard, Bruce Hornsby, Herbie Hancock, John Pizzarelli, Charles Lloyd, Brad Meldau, Billie Higgins, John Abercrombie, Benny Wallace, Kei Akagi, Clayton Hamilton Jazz Orchestra, Mighty Sam McClain, Terry Evans, Ronnie Earle, Taj Mahal, Jimmy Rogers, Jeff Healy, Fernando Ortega and Dixie Chicks. Michael recorded Christina Aguilera's Hit single on RCA, "Come on Over, Baby" (# 1 in Billboard "Hot 100 Singles Sales" - October 2000) and 3 songs for Samantha Mumba's A&M release ("Baby Come Over, this is Our Night", "Don't Need You To Tell Me I'm Pretty", "The Boy"). Ross recorded the #1 Hit "Lady Marmalade" on Interscope for Moulin Rouge featuring Christina Aguilera, Mya, Pink, Lil Kim and Missy Elliott. Also recorded 4 songs for Lisa Loeb's A&M release and mixed the live version of "Falsas Esperansas" for Christina Aguilera's RCA single. He recorded "Where the Dream Takes You" by Mya for the Disney film "Atlantis,". He recorded two tracks for the MGM film "Legally Blonde" by Hoku - single "Perfect Day" is released on Geffen and a song by Vanessa Carlton off of her debut album on A&M which got nominated for 3 Grammy's. Michael shared in the nomination on one of those for "Record of the Year" for the song "A Thousand Miles". Michael also recoreded tracks for Mya album released on A&M. He also mixed music for the 20th Century Fox film "Drumline" and recorded 150 piece marching band with Producer/Music Superviser Dallas Austin. Michael recorded 4 songs for Lisa Loeb on her release 'Cake and Pie.' Additionally, Michael mixed the end title song for the Denzel Washington movie "John Q," sung by Patti Labelle. 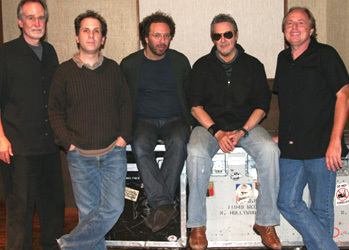 Michael has also worked with "Counting Crows" on their remake of Joni Mitchell's song "Big Yellow Taxi". Michael has mixed Acclaimed jazz group Medeski, Martin and Wood's hit "Uninvisible" album in 6.1 for DTS Entertainment. He mixed songs for JC Chacez's (of N Sync fame) first solo project. Also, Michael has done additional recording on Mya's A&M release. artists, most recently mixed for “The Pussycat Dolls” smash hit CD “PCD”. He also wrorked on Queen Latifah’s latest “The Dana Owens Album”, and on her live mix when she hosted the Grammy’s in 2005. Michael recently recorded and mixed Anthony Wilson’s brilliant CD “The Power of 9”, with special guest Diana Krall. Current Credits: 2008 took MCR to Northern California to producer Sylvia Masssys studio complex Radiostar (www.radiostarstudios.com) where he mixed JR Richards(of Dishwalla fame) first solo CD titled A Beautiful End, co-produced singer songwriter Jason Soudah along with Sylvia Massy and mixed a song The Puppet for hard rock band Godhead. Other recent credits include: A new CD for guitarist Anthony Wilson. Recorded live with famed musicians Jim Keltner, Jeff Hamilton, and Larry Goldings and produced by Joe Harley Michael has also recently worked with: Jerry Lee Lewis, recent Grammy Nominee Ledisi, and Lalah Hathaway.